Landscaping adds so much more to a garden so here are our top landscape gardening tips. •	Think about the design and layout of the garden in relation to your home. Your proposed landscaping should complement your home. That means your landscaped garden should match your house's colouring, style and scale rather than clash with it. Your landscaping should also help accentuate the appearance of your house rather than serve as a kind of camouflage hiding it. •	Plan well ahead. Before attempting to do any work on your garden and surrounding land it is advisable to have the proposed landscaping properly planned. Before attempting any kind of landscaping work, it is vital that you have the plans down on paper. That will give you a clear idea of how the landscape will look and how it will fit in with your property. •	Size is important. Also it is essential before you purchase any shrubs, trees, or plants for the landscape, you know just big they will be once fully mature. This will avoid buying plants and putting them too close to the house. This is important in case the plants, when they are have matured, grow over pathways, too close to the building structure, or block windows. If you are aware of the size of the plants when fully grown, that will avoid such unnecessary problems and allow space to do any work on the outside walls of your home. •	One of the most sensible landscape gardening tips is not to plant any Redwoods! Seriously, be aware of the danger of trees, when they have matured, growing up towards any power lines overhead. If you make that mistake you may have top off the tree sooner or later. That could be a massive headache, so it is best to choose carefully the type of tree to be planted while ensuring they are not situated under power lines. •	Keep your landscaping evergreen. 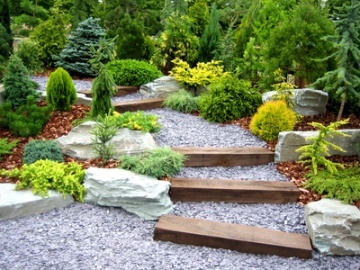 When planning your landscaping it is best to include a few evergreens. The size of your garden will determine how many evergreens you wish to have planted. A good ratio is to have evergreens as a third of the total trees and shrubs. They also add an attractive look to gardens during the winter when the deciduous trees are bare. •	Don’t forget the lawn. You should also make sure the plan of your landscape is properly thought out, particularly the position of your lawn. Lawns need a lot of care and attention, so make sure it is positioned so the necessary work on it does not become irksome. Landscaping takes up a lot of time and can also be costly. You also don't want your prize landscaped garden to cause you trouble in years to come. So if you take note of the landscape gardening tips mentioned above, your landscaped garden will give you years and years of pleasure. Landscape Gardening Tips - What Are Garden Accents?